It’s the last week of the year. When you’re not busy arguing with your manager about whether anyone you need to reach is going to answer the phone, it’s a good time to take stock in what you’ve built in the past year and how you’re going to make next year even better. 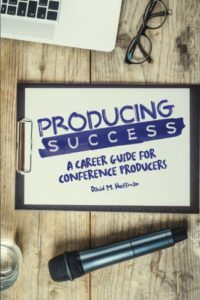 I wrote Producing Success: A Career Guide for Conference Producer in the spirit of initiative and self-driven career development. You can make anything out of your conference career if you’re resourceful – and the 21st century is full of resources for anyone with a little ambition. The first step to creating an unstoppable career path is setting goals. The first of the year is as good a time as any! When you imagine where you’ll be this time next year, what would you like to accomplish? Become a better event host? Get more involved in the sales process? Gain a reputation as an industry expert? Master DM copywriting and brochure design? Expand your network by a factor of 10? Launch an event in an exciting city you haven’t visited before? Quit your job and start and produce an event on your own? My goal for 2016 was to write my first book, which coincidentally helps you with all of those things. 2017, I recorded the Sweet Talkin’ Symphony. 2018, I brought you the Conference Producer’s Podcast – Don’t Produce Events, Produce Success! Why don’t you share your biggest accomplishment of the year below so that we can use it as our own inspiration? Producing Success: A Career Guide For Conference Producers is available at Amazon.com. Start the new year with a skill development plan to create the career you dream about.